Gathering Psychedelic Witchcraft's early legacy together, this shows the band's full future promise. Still basking in the glow of the success and critical acclaim of last year's debut, 'The Vision', Italy's finest purveyors of bluesy Doom, Psychedelic Witchcraft, have cannily decided to strike while the cauldron is still hot and release this new collection. 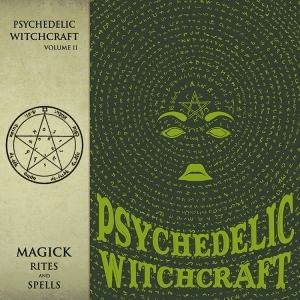 'Magick Rites and Spells' covers an interesting and eclectic array of material including the entire 'Black Magic Man EP', the band's debut release from 2015 repackaged here for those that may have missed it on original release; along with some well-chosen covers, re-recorded older material and new tracks made available here for the first time. Opening track, 'Come a Little Closer' begins with a seductively bluesy riff that morphs into classic 70s rock territory with just a faint suspicion of Doom malevolence lurking in the shadows. Singer Virginia Monti delivers an accomplished vocal that's infused with liberal dose of mystery, and a slight witchiness reminiscent of Stevie Nicks' darker moments. It's a sound that certainly wouldn't have been out of place in the halcyon days of the patchouli-infused Proto Doom scene of the late 60s and early 70s. The two covers on the album do much to demonstrate the band's fondness for that fertile era, particularly their interpretation of 'The Dark Lord', originally performed by Sam Gopal (featuring a young, pre-Hawkwind Lemmy) on the almost mythical 'Escalator' LP, first pressings of which now change hands for eye-watering sums. Suitably psychedelic, with some exceptional musicianship, it's a fine homage to a lost era. Blue Oyster Cult's 'Godzilla' is given the Witchcraft workover too, in a loose, bluesy interpretation with a strong vocal and a slight fuzz to Jacopo Fallai's guitar that adds to an authentically vintage sound. The latter half of the album comprises the four tracks from the 'Black Magic Man' EP, and shows the promise that Psychedelic Witchcraft demonstrated from their first release. It's clear that they were always going to make an impact with their blend of bluesy Occult Doom and flourishes of trippy psychedelia, and from their first release were a tight, accomplished unit. 'Angela', particularly, is a masterclass of Stoner Doom with a menacing, yet beguiling vocal, complete with cult 70s horror movie references in Virginia Monti's cry of 'Angela she's coming/she's the blood on Satan's claw' and a classic bluesy 70s guitar tone. Final track, 'Slave of Grief', begins with a remarkably stoned riff and a lament of 'I lost my mind in space and time/I don't know anymore where I belong', before building to a full-blown psychedelic freak-out to bring the album to a close. Influences are clearly visible through a haze of incense and exotic tobacco, but at no point does the album become tired or derivative, such is the quality of the delivery and the sheer unbridled energy that the band can draw on. 'Magick Rites and Spells' is a collection that looks forward, building for what should be a bright future, but with a nod to the past, the early legacy of the band. With some excellent new material and interesting covers, it's a fine companion to last year's much-lauded debut full length album, and suggests Psychedelic Witchcraft will have plenty more spells to cast on the Doom scene in the years to come. I for one can't wait to hear more. Visit the Psychedelic Witchcraft bandpage.